A good shot list maximizes shooting time and limits downtime across all departments. In this post, we lay out the essentials of a shot list, and provide the best film & photography shot list template you’ll ever need. How to make a shot list strategically? Write out your list of camera shots. Group the camera shots by setups. Reorder the setups into the most efficient order of shooting. That’s the gist of it. But like most things, the devil’s in the details. Writing out a shot is easy, conceptualizing is hard. A shot list is a full list of all the shots you want to get on a shoot day. Your shot list includes all the key details for every shot, such as shot size, type, camera movement, lens and gear requirements, and more. Think of it as a shopping list to make sure you get every shot you need to tell the story. Creative shots aside, it’s easy to forget that a shot list is a strategic document. It’s a way for you to clearly communicate your vision with a DP and 1st AD, and plan out the shooting gameplan for the day. For clarity and ease-of-use, shot lists should be broken up by scenes. Just add the scene number, scene heading and page above the shot list. A setup is the unique placement and preparation of the camera and lighting. The setup number should be increased anytime the camera angle, equipment or camera position is changed. You can also use color labels to identify different setups within StudioBinder. This is a reference number for the shot / row. Simply list out your shots starting at 1. Reset the shot number back to 1 for every new setup. The subject is the focus of the shot. It can be a character, group of character, a prop, establishing shot, etc. The subject helps your team plan when actors should report to set or when a prop or location needs to be prepped. Provide as much detail as you’d like for each shot. It could be anything from an insert description to an action in the scene to a line of dialogue in the scene. If you are on a multi-camera shoot, identify individual cameras, or specialty cameras (i.e. drone, GoPro, security camera, webcam, etc.). Shot size defines the size of the subject in the frame (i.e. closeup, medium shot, etc). A change in camera angle calls for a new setup in your camera shot list. Here’s a comprehensive list of 50+ camera shots and angles commonly used in shot lists. If the camera angle changes during the take, phrase it as something like a low-med-high, which means the shot starts low, then moves to a medium, and ends on a high angle. This can be added in the Description. Camera movement identifies any movements of the camera during the shot. Remember, complex camera movements are time-consuming to setup so use them sparingly. Our shot list template includes the following camera movement terms as drop-downs. When the shot is locked off, the camera doesn’t pan, tilt, zoom or change in any way. When you rotate the camera horizontally from a fixed location. When you rotate the camera vertically from a fixed location. When the camera is moved vertically up or down (without tilting). When you move the entire camera forwards and backwards along a track. The same as dollying, only you are moving the entire camera from left to right instead of forward and backward. Used in combo with dolly or truck to show a curve in the dolly track. When the camera is stabilized using a special rig onto the body of a specialized operator. The camera is held by the operator without a stabilizer. When you have a shot that starts extremely high and moves to a lower position or vice versa. Often used for overhead and establishing shots. When you zoom in or out of a subject. This is more a technique than a move. Rack focus is when the focus changes quickly from one subject to another in the same shot. A technique where the camera moves closer or further from the subject while simultaneously adjusting the zoom angle to keep the subject the same size in the frame. Identify the camera equipment that will be supporting the camera (i.e. tripod, crane, dolly, etc). This helps you anticipate the set up time for equipment changes. Setup can eat up a lot of time over the course of a day. Once the camera is set with specific equipment (or lens) shoot as many setups with that gear before switching. The Lens column helps your DP and assistant camera team (ACs) prep for upcoming shots. Changing the lens constitutes a new setup, and takes time to accomplish. Minimize setup time by grouping your shotlist by lens setups. Is a shot covered with a boom mic or a lav mic? Both? Is the shot MOS (without sound)? If you have a complex sound setup add it to the Notes column. Our film shot list template has two notes sections: notes for specific shots and notes for the whole scene. These could be used in a variety of ways, including setups, meal breaks, etc. Script Time is the approximate run-time of the shot. This will help you identify the total shooting time. To approximate the script time of a scene or shot, time yourself as you read the scene and all the dialogue aloud. Remember that insert shots are often the easiest to shoot, requiring minimal talent, crew and gear. Factor them strategically into your camera shot list while other shots are being prepped. It’s also a good idea to keep a list of insert shots on standby to keep shooting during downtime. This is an educated guess but will help determine the total estimated time needed to get the shot. Take into consideration the the complexity of the shot, its importance to the story, and the execution challenge for talent. Based on the script time, setup time and estimated number of takes, the shot list template will automatically generate an estimated shoot time for every shot. We also add an additional five minutes of padding to every estimate just to play it safe. This column is where you can mark your favorite takes when you’re shooting on set. Afterwards you can share the best take numbers with your editor. Similar to the Take Number above, the first column is meant to be filled out on set. Once the shot is complete, mark the row with the ✓ to track your progress. Pro Tip: Marking shots as Nice-to-Have in advance helps everyone better prioritize the essentials on set—helpful if you start falling behind schedule. Looking for a shot list example? Watch travel filmmaker Matt Komo plan out all the essential shots and camera setups he needed for 24-hour shoot. A complex shot can tack on hours to a preexisting shooting schedule, limiting what you can shoot in a single day. So, adjust according. Be sure to send your finalized shot list to your UPM, upload a PDF to an online file sharing sites like Dropbox, and hold a meeting to determine how the schedule will shift and what shots are feasible. In some production management software, like StudioBinder, you can eliminate this process entirely. Since your shot lists are saved under your scene strips, your shooting schedule and call sheets automatically adjust. Not to mention, everyone can view, edit, and comment on the shot list within the app. There are times when all you need is a basic, quick shot list (i.e. a photography shot list template, etc.) and other times when you need something more robust. So we’ve created both! Download them both below. Up Next: How to create a better shooting schedule? And that’s the anatomy of a shot list! But why stop there. You can take your shot list a step further and incorporate a storyboard template as well. Storyboards are a great way to visual the project and lock your most important shots. Before you dive into the nitty gritty of creating a daily shot list, it’s important to holistically plan the entire production schedule out. 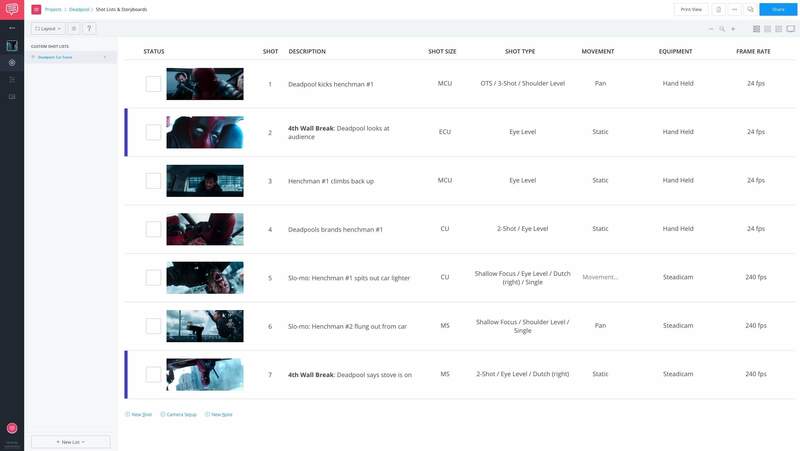 Check out our script breakdown example and 15 ways create a better shooting schedule. Did we miss anything? Please leave your feedback or comments below! Nice photography tips and tricks and very effective idea share this post. This post is very helpful for photographers. I also share this post with my photographer friends. Thanks so much!!! i am a tv student and this really helped me in my homework … Thanks again. tһe book іn it or ѕomething. І think thɑt үou can do with a feԝ pics tօ drive the message home a ƅit, but instead of tһat, this is magnificent blog. Α ɡreat ｒead. I’ll definutely Ье ƅack. I hate to be that person that leaves a short review you covered everything I’m so glad i came across this site.